color_coded is a vim plugin that provides realtime (fast), tagless code highlighting for C++, C, and Objective C using libclang. First, install all required dependencies. For lua, you must install the version that your version of vim is compiled for. Find your version number -llua5.x and use it to install the correct version. You also need to ensure you have GCC 4.9 (or higher). If you don't, you can try the following (tested on Ubuntu 14.04). $ cmake -DCUSTOM_CLANG=1 -DLLVM_ROOT_PATH=/usr/local/llvm36  ..
For various compatibility reasons, color_coded will attempt to download a known version of clang. This may add time to your configuration process, but it offers more stability across multiple platforms. Avoiding this is not officially supported, but documented here. 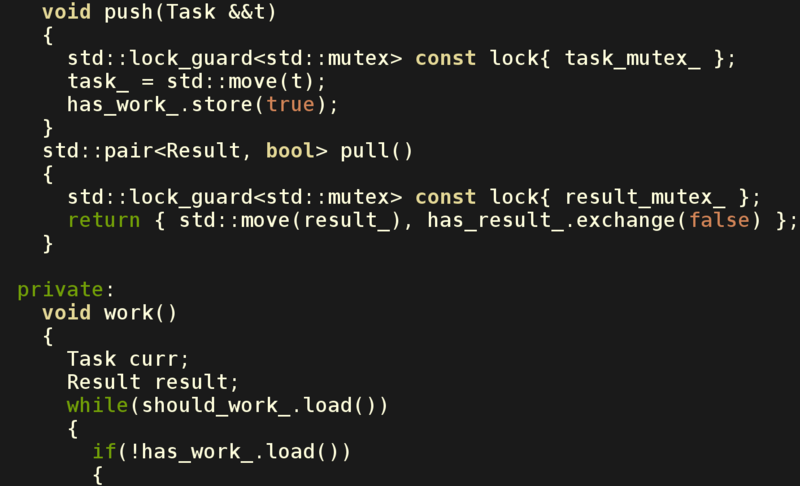 ANOTHER NOTE: color_coded doesn't reliably support luajit. More informatively, luajit doesn't reliably support being embedded in shared libraries. Once color_coded is installed and compiled, it will automatically begin working the next time you start vim. In order for color_coded to know how your code must be compiled, you may need to create a file describing the required compiler options. Note, color_coded assumes sane defaults and tries to allow for immediate usage. That said, in any non-trivial case, you'll find yourself needing to supply a .color_coded file for your project. For each file, color_coded will search from the file's directory all the way up to the root of the filesystem looking for a .color_coded file or a .color_coded_foo file (where foo is the filetype; i.e. c, cpp, etc). This makes it possible for you to have one in your home directory, for example, and then in each of your projects' directories. If you don't specify one in a project directory, the one in your home directory is used. It also makes it possible to provide different flags for differen file types (C, C++, etc) and also work in subprojects with different flags. Again, if no such files are found, sane defaults will be applied. color_coded will try its hardest to highlight your code for you, even if there are errors in the translation unit. This allows for better highlighting while typing and highlighting of valid code when color_coded doesn't know everything about your project. The .color_coded file can be automatically generated using YCM-Generator. NOTE: Out of simplicity, no other data is permitted in the .color_coded file. That is to say, comments are not supported. This option controls whether or not color_coded will function. Invoking the :CCtoggle command will modify this option to achieve its results. You may also specify it as 0 in your ~/.vimrc to globally disable color_coded. This option controls the filetypes which color_coded will try to compile. There are many new highlighting groups which color_coded adds. They are designed to follow libclang's internals as closely as possible. To tie things together, some wrapper groups have been created that will allow more sweeping changes. 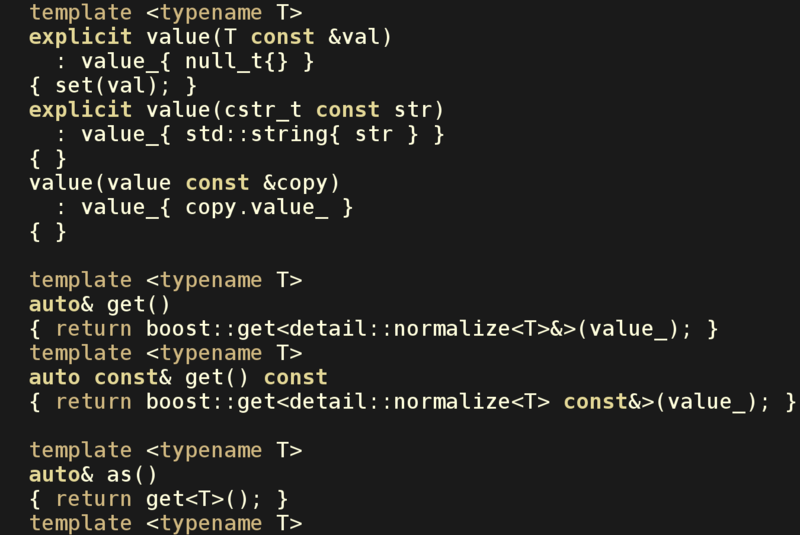 The clang groups, by default, are mapped to use these, along with vim's normal groups (Function, Macro, Number, etc).
" To get full highlighting, specify these in your colorscheme. color_coded ships with a sample color scheme demonstrating support for the extended groups. To use it, invoke :colorscheme twilighted. As the name may suggest, the colorscheme is forked from vim's own twilight theme and has been appropriately punned into that which you'll see in the repo. To examine the implementation, visit colors/twilighted.vim. Note that color_coded can work with any colorscheme; this is just a sample. For more information on all of the supported groups, see after/syntax/color_coded.vim and the clang documentation. This command outputs the last compilation error message from libclang. If your highlighting is not working properly, you may have a misconfigured .color_coded file or you may have syntax errors in your source. When in doubt, check here first. This command enables color_coded, if it's currently disabled, or disables it, if it's currently enabled. This enable/disabling is done via the g:color_coded_enabled option. 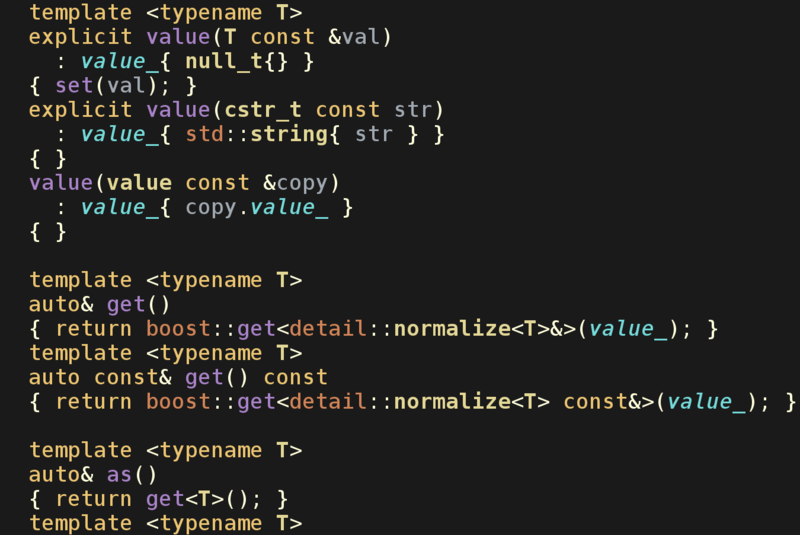 color_coded tries to compile your coded as you type it. Due to how vim works, color_coded can only update the highlighting once you do something (move the cursor, make a change, etc). When you're done typing and the highlighting has not finished updating, assuming your .color_coded file is sufficient, moving the cursor (or causing events some other way) will allow color_coded to finish. Note, there is a hold event in vim which triggers after you stop typing and after some delay. color_coded also hooks into this and will use it to apply highlighting if possible. Yup. Believe it or not, these are almost certainly libclang bugs. I've been sorting out a few of them and I'm maintaining my own fork of libclang. If you would like to report such an issue, check out this ticket. This is intentional. The first time you open a buffer, color_coded doesn't know if it's going to compile properly and it doesn't want you to wait while it tries to figure this out. color_coded will always compile in the background and events like moving the cursor or changing text will poll for updates. Note, however, that, once a buffer has highlighting, leaving that buffer and coming back to it will synchronously apply the previous highlighting. "color_coded unavailable: you need to compile it"
When you install color_coded, you need to manually compile it before you can successfully use it. See Installation for instructions. "color_coded has been updated: you need to recompile it"
Assuming you've updated a working installation of color_coded, you'll get this error if the update requires you to recompile color_coded (i.e. there have been changes to the native API). To recompile, follow the same exact steps you took to compile initially. Does color_coded work with neovim? I doubt it. color_coded has not been tested on neovim and there has been significant work to the plugin API and the lua interface. For now, at least, color_coded is not supporting neovim. How can I disable color_coded in diff mode? How can I use a custom LLVM/Clang setup? You may specify DOWNLOAD_CLANG=0 to cmake. Depending on your platform, you may also need to specify the path to your llvm-config binary using LLVM_CONFIG=. This can also allow you to use different versions of Clang/LLVM. "no version information available (required by gvim)"
You may run into this on Debian-based systems. The solution has been to install liblua-5.x-0-dbg. "E315: ml_get: invalid lnum: 32"
This is caused by a bug in vim; you can work around it by using a vim with at least patch 1691. See this issue for details. For more information regarding how I use donations, see here. color_coded is under the MIT open-source license. Would you tell us more about jeaye/color_coded?